Libby's Little Addiction: June 2018 My Monthly Hero - Release Blog Hop + Giveaway! June 2018 My Monthly Hero - Release Blog Hop + Giveaway! Hello and welcome! 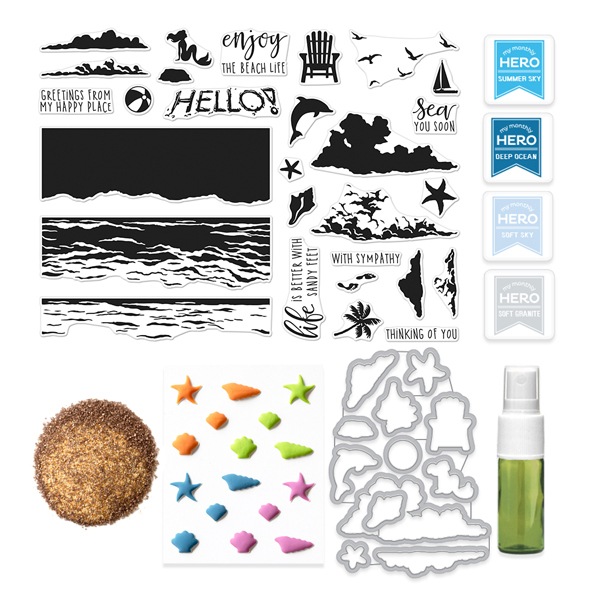 Today I'm hopping with Hero Arts and friends as they release the June edition of My Monthly Hero and the associated add-on products. You should have hopped here after visiting Jessica Frost-Ballas. If you didn't, head back over to the Hero Arts blog to start at the beginning! This month's kit is probably up there on my list of all-time favorites. It takes me away to a relaxing day at the seashore, and I very much love that! You'll see a couple of the projects I made with it over at the Hero Arts blog today. Here are a couple more, with ideas beyond the beautiful Color Layering water stamps! For this first card, I used the oh so fabulous sand embossing powder in the kit to create texture on some starfish! I began by applying direct-to-paper Summer Sky ink (included in the kit) to create the blue background. Next, I embossed some scrap cardstock with the sand embossing powder (again applying the VersaMark for the embossing direct-to-paper), and then I die cut the starfish. They are popped up with foam squares for fun dimension. For my second card, I created a sympathy card using some calming images from the kit. Again, I began by inking up the background direct-to-paper with the Summer Sky ink. Next, I stamped the base cloud images using Unicorn White ink. Once it was dry, I stamped the second layer using Soft Granite. I love the beautiful birds flying around the card, stamped in Intense Black ink. Here's a look at the entire amazing kit. I am fairly sure this one is going to be a quick sellout! I'm part of an amazing blog hop today! Be sure to leave a comment for everyone along the hop - Hero Arts will be drawing a winner among all the comments to receive a free kit! Get your comments in by Sunday, June 10 at 11:59pm PST. Thanks for stopping by today! Be sure to grade your kit before they are gone. Check out all of the fun add-on products, too! You can buy them all and save a little money, if you love them as much as I do! Affiliate links are used on this blog, at no extra cost to you. Thank you for supporting me, and clicking on my links to shop! I'm showing the entire release, for your convenience. Beautiful cards. I love this clouds and the birds. Just love your cards, Libby! You really made this kit shine!! Beautiful cards - the sympathy card looks so peaceful, and the starfish on the first card - clever clever!! TFS! Beautiful cards--I especially love the sympathy card! This is my favorite Hero Arts kit EVER! I have already placed an order for myself and my daughter. I can't wait to get my hands on it and play with it. The kit contents seem so well thought out. Looking forward to trying out the sand embossing powder. I love all the sentiments too! Your starfish are sea-spectacular! They look real enough to put on the beach! Your condolence card is nice too. Thanks for sharing for such an occasion. I never know the right words to say and this would be a good start. These are beautiful, as are the ones on the Hero Arts blog. This is the best kit ever! Beautiful cards, love the sympathy card! Thanks for sharing! Your cards are beautiful. I do like seeing some sympathy cards which, unfortunately, are a need! Libby, I was especially taken with your simple and calm sympathy card. Very well done! Cute cards! Thank you for sharing! Great idea for sympathy cards. Thanks for the inspiration. Both lovely cards. 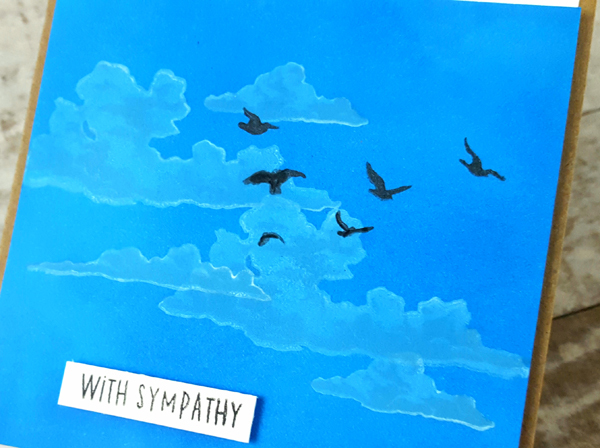 I love the clean and simple designs: from the embossed starfish to those subtle clouds on the "with sympathy" card. Great job. I love the simplicity of your cards! Such a great kit for all types of cards! These are both gorgeous! The sandy starfish are so perfect! What a great idea! The little starfish are adorable! The blues used and the clouds are so very beautiful. Sweet cards!! Love this kit!! That sand embossing powder is so amazing! So sad the kit sold out already! Thanks for the chance to win one ! :) fingers crossed! Oh Libby! Aren't those starfish just THE CUTEST.....love how you've done your cards. What a VERY special sympathy card too. Thank you so much for sharing your creativity. Love the sand starfish, how you emphasized the blue inks to create such pretty cards, and the serene sympathy card. Great kit! So lovely! I love all of the details you put into these. 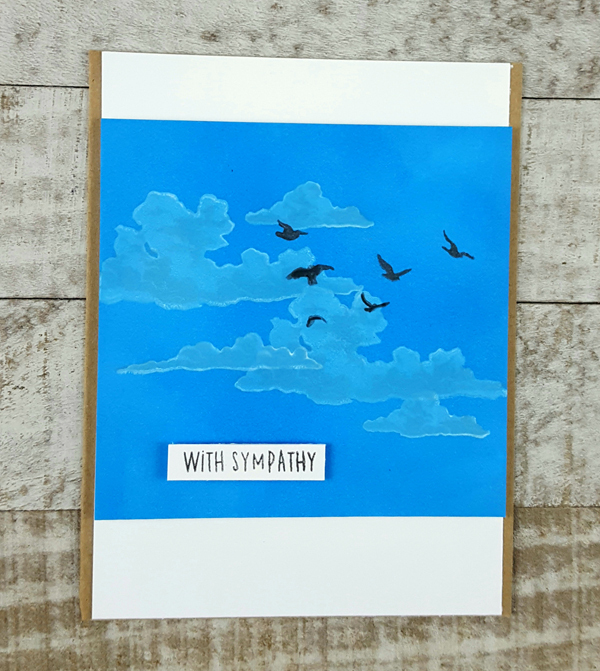 Love your creativity with the sympathy card! Its stunning! Both of your cards are stunning! I love the small starfishes! Such a great idea to use the embossing powder for texture on them. Hi, Your cards are beautiful, love the colors. This kit is awesome, I really love this one. Thanks for showing us some amazing cards, appreciate your time. Thanks. Stunning cards! I love this kit! It's so versatile! What a great idea with the starfish. Love your cards! 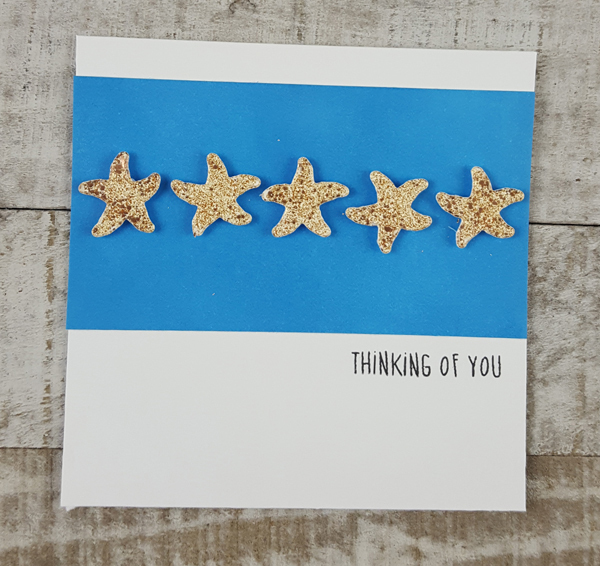 Cute starfish card and a sweet sympathy card. 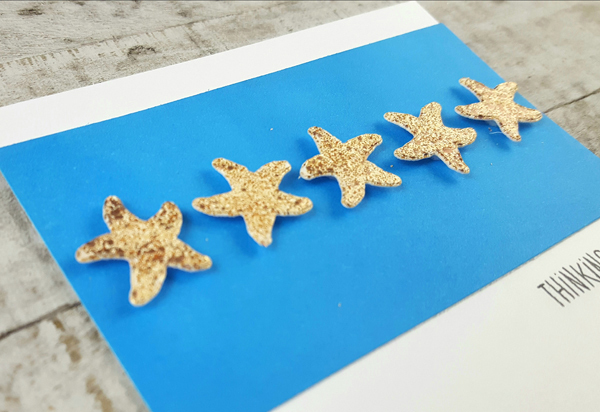 Love the sea star card... the embossing coupled with popping it off the front of the card really makes them feel like real sea stars! Need to make a couple sympathy cards. You gave me some great ideas. Thanks Libby and thanks HA for a great June kit...it's already sold out!! Ooooh, I LOVE this adorable little starfish card! How creative! Beautiful work, as always! The new sand embossing powder is awesome! Whoever came up with that idea is genius. Beautiful cards! Love this release. Love your use of the sand embossing powder on the starfish. Fun card! Great cards and love that sand embossing powder! I sure hope to win this kit. love the sympathy cards. i will have to make some of these, great ideas! Great, unique samples of the products! Love your beautiful cards. It's great to see sympathy cards for inspiration and the starfish card is so clever. Beautiful sympathy card and I like the starfish in a row. Libby, your Starfish look so real, what a great idea! The sand embossed stars are so cute what a great idea!! I also love how you used the kit to make such a beautiful sympathy card. I love the sea star texture!! Thank you for sharing. What a lovely sympathy card, love your little starfish with the sand embossing powder. Oh, I love those fun starfish! Great cards, I love the starfish! Thank you for the inspiration! Fantastic cards! Beautiful inspiration and wonderful CAS designs. Lovely cards - very tranquil, so they are well suited for the sympathy messages. Beautiful cards! I love the starfish one. Beautiful cards. I love the sympathy card. I love this kit. Thanks for inspiring me. Lovely cards. Can’t wait to use that sand embossing powder! Your starfish are so cute. This card is a star for sure. This kit is so versatile. I wouldn't have thought to make a sympathy card or a row of starfish. Very clever! Fabulous cards! I love the starfish card! Love these Libby, isn't that sand EP awesome? It looks totally real! Love the texture the sand EP gives those darling starfish & the sympathy card is perfect! Great design on both! Wow! I thought the starfish were real...really awesome ideas! Thank you! Your first card is really super fun !! Who would not love this kit after seeing all these great cards so inspired. I am loving the blue inks in this kit! Cute cards! Love the starfish card! Oh how I love this kit. Oh how I'm sad that it went so fast. Those stamp images are just perfect, for beachy scenes or beautiful skies like yours. Great cards, wish I had bought this kit. Love your starfish card using the awesome Sand EP. Wouldn't have thought to use the stamps for a sympathy card, but your card is beautiful and very peaceful. Love your card! Especially the starfish! That sand embossing powder really makes them look real! Thanks for the inspiration! Love those birds! Your cards are great! Oh, I love those star fish! Great texture with the sand embossing powder... must feel really cool in real life! Those clouds are amazing! Love this kit! Great cards and love the starfish!! So cute!! So cute Libby You give me great ideas for when my kit arrives! So stunning, Libby! I love sea themed cards. Libby, love them both but those starfish! The starfish are a fun idea. A simple card that is great. Love the birds in the sky. Love your starfish, what a great idea to create your own embellishments. THe sympathy card is good too, love that idea, need to make one may do an ocean themed one. Your cards today are great but I loved you sandy toes card from the other day. Great kit, can’t wait til mine gets here. Beautiful cards - love that Summer Sky blue ink. So glad I ordered one of these kits already. Thanks for the inspiration! WOW.. Those starfish look amazing.. The dimension.. wow! Lovely cards! Awesome texture and color on the starfish! Such wonderful cards. Love, love this kit, too. I love this kit and you've made lovely cards! I am dying for this kit. Love your cards, Hero Arts kits are just wonderful. Just lovely - this kit is amazing! Love these elegant cards. Thanks for the inspiration.